Although mass media, major corporations , and even the government emphasized the need for new business start-ups, only 407 enterprisers chose to venture forward and start their own business in 2013, which is only about 0.07 percent out of about 560,000 university graduates. The percentage of new enterprises is lower than that of United States, which is 10 to 20 percent, and even that of China, which is two percent. The government and the media play major roles in encouraging new business establishment. However, the disappointing results show there are fundamental institutional problems which need to be addressed to effectively support the start of businesses of young people. In order for youth start-ups to succeed, it is important that the youth themselves have a positive mindset and the drive to start their own businesses. However, it turned out that university students actually prefer becoming public officials or being employed by major enterprises, in pursuit of financial stability. According to a survey by the National Statistical Office conducted in 2013, 31.9 percent of economically inactive applicants aged 13 to 29 years old were found to be preparing for the national Civil Service Examination. Since last year, the number of level-nine public official applicants exceeded 200,000 and the competition ratio reached the highest level this year at 1:19.2. The preference to work at a large corporation has also increased. According to Alba-Chunkook, a portal site providing part-time job information, 35.5 percent of 2,557 job seekers said they preferred to be employed at major enterprises, such as Samsung and Hyundai, or at public companies such as Korea Electric Power Corporation. Among the reasons young people do not attempt to start their own companies is their negative or indifferent attitude toward business start-ups. As shown in the survey conducted by the Ministry of Education in 2013, 53 percent of those surveyed replied that business startups had not even entered their minds while 39 percent replied that the idea of young people starting their own business was a reckless venture. Eight percent of the remaining respondents said they thought starting a new business would be a challenging experience. The replies of Hanyangians were no different from these statistics. According to a survey conducted by The Hanyang Journal, only four percent of Hanyangians out of 537 respondents said they considered starting a new business. In “Believe It or Not”, an American Television show introducing strange phenomena around the world, Korean high school students were once featured studying until late at night in school. In the show, the panelists of the program were shocked at the sight of students studying until such late hours. The episode demonstrated how the Korean education system is heavily concentrated on the college entrance exam known as Sooneung. Korean students early on in their scholastic careers are typically taught to take notes on their teachers’ lessons rather than discuss issues when they study. This type of learning is known as “cramming education” or education based on rote memorization. Korean students who have gone through the educational system of Korea tend to develop a passive attitude which can hinder their ability to pioneer new things. This ability is often crucial for the success of business start-ups. “The Korean educational system hinders creative thinking and subtly directs students toward the paths of the older generation rather than encouraging them to consider their own. This kind of ‘herd behavior’ leads to the pursuit of safe jobs and pursuits instead of challenging and potentially more rewarding ones, and thus a hesitancy to try or start new things. Even when some young people accept a challenge, they often feel they have to assume all the responsibilities, from establishment to operations, by themselves, which is something they are neither accustomed to nor prepared for,” said Lee Jae-bok, a Professor of Department of Korean Language and Literature and Researcher of Korean education. The educational problems are highlighted in the college entrance exam, Sooneung, which ultimately decides the university which a student can enter. In France, however, a different examination system that determines which college a student can possibly go to exist. There is the baccalaureat, an academic qualification test which French and international students take at the end of their secondary education. The test consists of only one open-ended question and students have to give their own answers in four hours. As there is no academic gap between universities in France, these academic institutions do not need to grade students on a curve. Lee said, “The purpose of the baccalaureat is to make students think openly and continuously in order to foster citizens who can think and behave independently. As a result, Salon des Entrepreneur de Paris survey conducted against French people showed that the majority stated they preferred to start their own enterprises as students or after graduation, and more than half of the respondents aged 18 to 34 years old answered that they wanted to start a new business. Start-ups are based on creative thinking so education that encourages this ability is extremely important. However, current Korean education fails in this regard and instead only encourages fierce competition where universities select students based on a test consisting of multiple choice questions. The number of the young people entering newly established corporations is rising while the proportion of youth starting up businesses itself is on decline, from 31 percent in 2008 to 28.4 percent in 2012. In addition, young entrepreneurs tend to focus more on the service sector compared with their over-40s entrepreneur counterparts. According to the Small and Medium Business Administration, there are only 4.7 percent of new businesses run by young people out of 74, 162 total new businesses. Also, 73 percent of these young people claimed they had plans to venture into the service industry. In 2012, 175 out of 424 universities operated youth start-up support programs that depended on government funding. The government has invested about 19 billion Won into operating funds for universities’ start-up support programs and this amount makes up 84 percent of the total budget for these programs which is 22.4 billion Won. 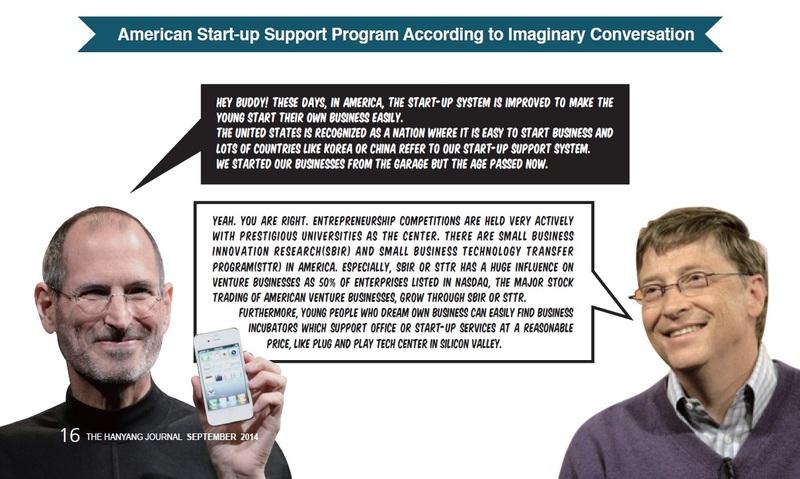 Start-up support programs are mainly overseen by the Korea Institute of Startup and Entrepreneurship Development. Also, local governments are supporting youth start-ups through institutions such as the Korea Technology Finance Corporation. Seoul, Busan, and other major cities operate youth business incubation centers and the Youth Start-up center based in Seoul is expecting to extend to 16 areas and cities around the country. In addition, there are 218 support systems for youth start-ups which are being introduced in Creative Economy Towns but these have different support timetables, objectives and ways of each. 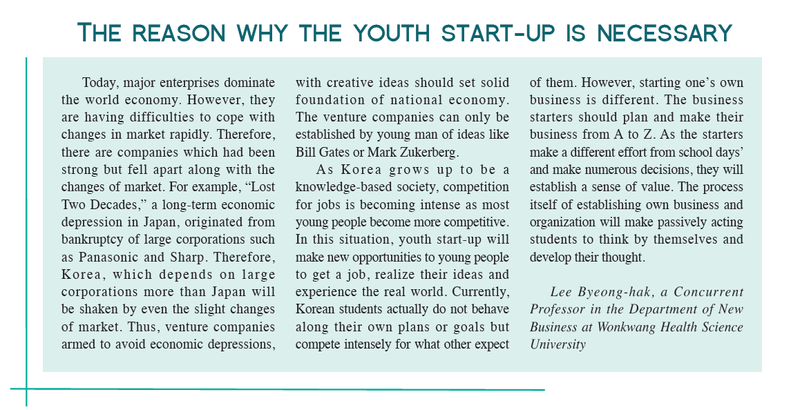 Although about two hundred support programs are available in Korea and about 20 billion Won is being provided in the form of support for youth business start-ups, problems such as complicated administrative procedures of different documents from each supporting organization, difficulties in raising funds, and a lack of information about business operations are all obstacles in the process. Young applicants of government funded programs experience difficulties even when applying to these programs. This is because the application period, the required documents of each organization involved, and the processes all vary, making it difficult to conveniently proceed. As for financial grants for youth start-ups, the current system calculates funds to support certain new businesses if they gain approval. However, the prior approval request system which should be maintained in order to obtain support fails to meet reality. For instance, a person who is given financial support has to submit documents such as employment contract or university graduation degree every month even though it does not make sense to re-submit these documents. Furthermore, depending on their scholastic records, applicants can get different grants which are paid in form of a salary. For example, an employee who has a PhD in Philosophy can get 2.5 million Won as a monthly salary, while an employee with only a high school diploma receives only about one million Won per month, according to official guidelines. In addition, there is a shortage of advisors who can offer business startup information and advice students who would like to start their own businesses. For example, Babson University in the United States and RWTH Aachen University in Germany recruit only professors who have start-up experience or experience in the industry. They offer mentoring programs on how to start a business according to each field. Making use of these programs, students are active and enthusiastic about starting their own businesses. In order for young people to understand and actually use the startup support programs, there should be an integration of support systems. It is important to provide various programs, but in order for applicants to more easily and conveniently choose the proper support program that is most suitable for them, a level of integration is needed. Currently, the Creative Economy Town, a representative website for creative economy operated by the government, compiles information about start-up support programs but it is limited to only classifying the ones available; applicants need to research and check out all the administrative processes themselves. Therefore, applicants are having a difficult time trying to narrow down the most suitable system for them. There is also the problem of selecting compulsory classes which must be taken by the users of start-up support programs. However, their priorities about which classes to take are not considered by the administration and some end up having to take classes that are not necessary for them or ones they have already taken. “Lots of people I meet are dissatisfied because they have had to attend classes that are useless to them. To resolve this problem, applicants should be able to choose the education they think they need,” said Jang Hyeon-suk, a researcher of the Korea International Trade Association. Young people who plan to establish or expand their own businesses have difficulties in obtaining information about market conditions or features in each field as well. Therefore, there is a need to create a specialized mentoring program that makes it easier for them to gain market information as well as learn from professionals of each industry. “If the government can develop a network like this, it will be possible to share stories about successes and failures among the important individuals of enterprises and this would be very useful. It can also help people to overcome difficulties when it comes to creating a new business by inspiring them to move forward,” said Jang. In addition to the existing programs, the government can learn from examples abroad. Last year, a website called Kickstarter drew the attention of startup beginners in America. Through this crowd funding system, a person can make and submit documents including a business plan, and present the item he or she wants to market, while describing its features and the business goal. Then, other site users can see the documents and item and decide to invest in it or not. In 2012 alone, about two million people invested in businesses introduced on the website, and more than 300 million dollars was generated through 18,000 projects that were actually carried out. “The crowd funding system actively encourages young start-ups. However, at present, crowd funding is illegal in Korea. Efforts should legalize it so that start-up beginners in Korea can utilize it for their businesses,” said Lee Byeong-hak, a Concurrent Professor in the Department of New Business at Wonkwang Health Science University. “Just do it.” Most people have heard of this renowned commercial slogan of Nike, the famous sports equipment brand. This short phrase has been made known all over the world, and is still used today. 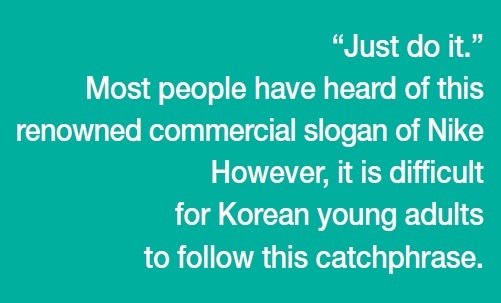 However, it is difficult for Korean young adults to follow this catchphrase when they are under intense pressure to gain employment as quickly as possible. People in Korea often say, “The era of a million youth unemployment has arrived,” describing the dire unemployment situation. Many young people yearn to be free from the pressures of finding a job as soon as possible and yet are struggling to find desirable employment. Therefore, educational as well as social systems should be reformed in ways to focus on the integration of support programs, freedom of curriculum choice, improved infrastructure, and introduction of the crowd funding system in order for young people to stop being afraid of venturing out on their own to utilize their creativity in order to implement their business ideas.